While it is important not to underestimate your competitors, you also should not consider them perfect. Industry leaders often maintain their position due to certain core factors and their other initiatives can be flawed, do not assume everything they do is right. Simply because a competitor decided to pass on an apparent opportunity does not mean they made the correct decision, they may have misjudged the opportunity and left an opening for you. I have repeatedly said and written to not underestimate your competition (most recently here), but experience has shown me that you also should not overestimate them. One mistake we often make is to think industry leaders are perfect. Several years ago I worked for a top-5 social game company (okay it was Playdom as most of you have access to LinkedIn). We were very envious of the leading game company at that time, Zynga. Everything they seemed to do, from new products to new features to marketing, worked. Almost always when we identified an initiative at Zynga it inspired a similar initiative. In fact, when I wanted to pursue something, I found it was best to wait for Zynga to try it and I could then easily get internal support (conversely, if Zynga was not doing it, it was usually a non-starter). Fast forward a few years and Zynga acquired Spooky Cool Labs, where I was Chief Growth Officer. Although the bloom was off the rose at that point, I did have a chance to speak with some Zynga veterans who were there when I was at Playdom. What I learned was that many of the initiatives that “inspired” us were considered disappointments at Zynga. There were several key drivers for their success but not everything worked well, or even worked at all. Sometimes the success factors overshadowed the failures and other times they did not even initially realize the initiatives were net-negatives. While I have had the fortune to work at both the hunter and the hunted, I have also seen many companies over-estimate the market leaders in various industries. Most automakers copied GM until they saw that GM was on the verge of bankruptcy. Foreign airlines copied US ones’ yield management pricing until the US airlines needed government aid. The list is almost endless of industry leaders leading the competition off a cliff. A recent experience highlighted another mistake of over-estimating the competition. A few weeks ago we launched a new feature in one of our products. The offering was not unique; it was largely common sense for any social casino. We actually knew that our two largest competitors had considered the feature and it would have been quite easy for them to implement. Although our feature was not a huge effort, we delayed it and spent a great deal of time looking at possible downside because our competitors had not tried it earlier. We believed they clearly knew the market and obviously wanted to optimize revenue. Finally, we decided that we might as well try it, it seemed like to good an opportunity to pass on. When we launched the feature, we saw a 21 percent increase in revenue (through an AB test). The uplift has settled in the 10-15 percent category but given the limited effort we consider it one of our greatest successes of the year. We still do not understand why our competitors have never launched a comparable feature (even after talking to a person who worked on a comparable feature at one that was never launched). More importantly, we now know we should not place too much credence in a competitor’s decision not to try something (feature, new product, etc). We are still conscious if a competitor scales back something they have launched as that decision is probably based on the traction that they have witnessed but we are also conscious that they are no more omniscient than we are. While it is never good to underestimate your competitors – they have many smart people trying hard to succeed – you also should not assume they are perfect. Even the most successful are probably doing some things wrong, and their success may cover up the mistakes. And while they have also looked at the market and talked to customer, they do not always come to the right conclusions on the best way to move forward. It’s why competition always leads to better products and companies. Look at the competition, but also make decisions on all the information you have available. We operate in a very volatile environment worldwide, with many external risks (Brexit, Trump’s victory, Russia’s invasion of Ukraine) difficult to predict but very impactful. To succeed, you not only should look at direct risks but overall risks to the value chain that will cascade to your company. The key is to understand and plan for risks that will impact competitors, your supply chain (anything from raw materials to cloud capacity),distribution channels and customers. Good companies will be ready to not only deal with but also capitalize on external changes that they do not control. Businesses always have had to deal with external risk (as opposed to business risk, ie. a competitor bringing out a better product) but it seems that these risks are magnified in the current environment where we are seeing seismic and often unexpected changes in government, economic policies, etc. Were automakers who moved operations to Mexico prepared for a Trump victory, were banks who set up international headquarters in London thinking about Brexit, were call centers that built their infrastructure in Manila ready for Duterte? The same goes for legislation and regulatory, were companies that based their operations in Ireland expecting the Google ruling or were trucking companies ready for the cap on greenhouse emissions? Many companies take the position that they cannot control or predict these risks so they just need to conduct business as usual and deal with situations when they occur. That attitude, however, can leave you company with few or no options and thus unable to recover from the external shock. Fortunately, risk is not new and over the years the companies that have best sustained success have developed ways of dealing with risk. I came across an article from 2009 in the McKinsey Quarterly, Risk: Seeing Around The Corners by Eric Lamarre and Martin Pergler, that shows best practices in identifying (and thus preparing for) potential risks. Most companies do have some system in place to identify risk, though I have seen some whose systems is bury your head in the sand, but even with systems in place they often only look at direct risk. For example, they may be worried about the risk of being banned from China so the government can help a local company, but they are not looking at the risk that a drought in China could bankrupt all their local distributors. Lamarre and Pergler point to the situation in Canada in 2007 when the Canadian dollar appreciated 30 percent versus the US dollar. The Canadian manufacturers did understand the impact of the currency change on how competitive they were in the US. Most Canadian companies, however, did not see how it would impact Canadian consumers (75% of whom live within 100 miles of the US). Thus, not only did their US sales crater but so did the bulk of their Canadian sales. They actually had hedged to minimize the impact on US sales, but they were unprepared (and many did not have the resources) to protect themselves from the squeeze on revenue in Canada. The best way to assess and manage risk is to look at all levels of the value chain. Once you understand these risk areas, you can see how they cascade to the core competitiveness of your business and what steps you need to take to mitigate the risk. The key areas of the value chain to analyze are competition, supply chain, distribution and customers. While most companies constantly monitor their competitors’ product offerings, the greatest risks are often less obvious. External factors might change a company’s cost position versus its competitors or substitute products. Companies are particularly vulnerable to this type of risk cascade when their currency exposures, supply bases, or cost structures differ from those of their rivals. Sometimes good and sometimes bad but all differences in business models create the potential for a competitive risk exposure. For example, look at two fast food hamburger chains. The fast food business is largely price/value dependent. If one year a drought drives up the price of livestock feed, which then drives up the price of beef by 50 percent, it could have a huge impact on a company that sells millions of hamburgers. It should not fundamentally change the business because all chains face the same situation. However, if your competitor regularly hedges the price of beef by buying futures, then they can potentially keep prices constant even if beef prices spike while you might have to increase substantially your price. Thus a previously stable economic situation could quickly change to one where you can no longer compete. If some players hedge and others do not, cattle price increases force the nonhedgers to take a significant hit in margins or market share while the hedgers make windfall profits. Companies must often extend the competitive analysis to substitute products or services, since a change in the market environment can make them either more or less attractive. In the hamburger example, high cattle prices indirectly heighten the appeal of salads, which would drive down demand for burgers. The goal is not to mimic your competitors to eliminate these but think about the risks you implicitly assume when your strategy departs from theirs. Supply chain risk often cascades to your business. If you are a technology company and cloud storage costs double overnight (maybe due to new regulations), all the software as a service companies that were giving you services would be forced to increase their prices. While you may have created contingencies yourself to manage your cloud storage costs, you probably would not have anticipated the cost increases of all SAAS suppliers. If some of your competitors managed these services internally, they may not have to shift their prices or service significantly. Thus, it is not only the direct impact of the change in costs but also the indirect impact. Indirect risks can also lurk in distribution channels: typical cascading effects may include an inability to reach end customers, changed distribution costs, or even radically redefined business models. Facebook is a great example of this risk in two ways. When it first embraced gaming, it provided some companies at that time (i.e. Zynga, Playdom and Playfish) a way to reach hundreds of millions of people at very little cost. Thus traditional game companies like THQ and Acclaim saw their share of users wallets decrease or have their players pulled away to the Farmvilles and Social Cities of the time. So even though FB did not directly impact THQ and Acclaim, it effectively bankrupted them. Then, when Facebook changed its model in 2011 so companies had to pay it 30 percent of revenue, the impact both direct and indirect had a huge competitive impact. Overnight, profitability for FB dependent game companies fell 30 percent, forcing companies to change their cost structure, migrate to other channels or cease to exist. Companies that were not dependent on Facebook, primarily other online MMO companies, had a significant advantage. While social game companies may have been aware of the risk of Facebook credits, they generally did not understand how it would benefit certain competitors. The key to anticipating risk and managing your exposure is to assess the full risk cascade. Exploring how that risk propagates through the value chain (competitors, supply chain, distribution and customer response) can help you think through what might change fundamentally when some element in the business environment does. Look at the direct risks and how they will impact your business. Take those same direct risks and see who they will impact your competitors, they the supply chain, then distribution and then your customers. For each of these, determine how that impact will effect your business. For each of the four elements of the value chain, look at their direct risks. Then look at how that risk will impact the other three elements on the value chain. From there, determine how it will impact your business on the value chain.For example, identify the risks to your customers. Maybe the value of their local currency will decrease due to changing political affiliations. With a weaker currency, they will have inflation and more of their wallet will go to core products. They will thus have less disposable income. For you, it may mean you are at a disadvantage to local suppliers (whose costs are in the local currency) or that these people will just be spending less on your product category. Thus, if you are well prepared, you may have a lower cost product available or be able to shift your marketing to territories where users are less impacted. Build contingency plans not only for the direct and obvious risks, but other risks that can indirectly have a significant impact on your business. In these volatile times, it is important to anticipate and have contingencies for external events that can significantly impact your business. Simply saying who could expect a certain election result or a natural disaster and thus our company is bankrupt is not an excuse except possibly in your next job interview. Good companies will be ready to not only deal with but also capitalize on external changes that they do not control. I have written frequently about the importance of knowing your competitors (competitive intelligence) and I also love Nir Eyal’s Hooked model to build products that retain; I just came across a slideshow by Nir that brings both of these concepts together. 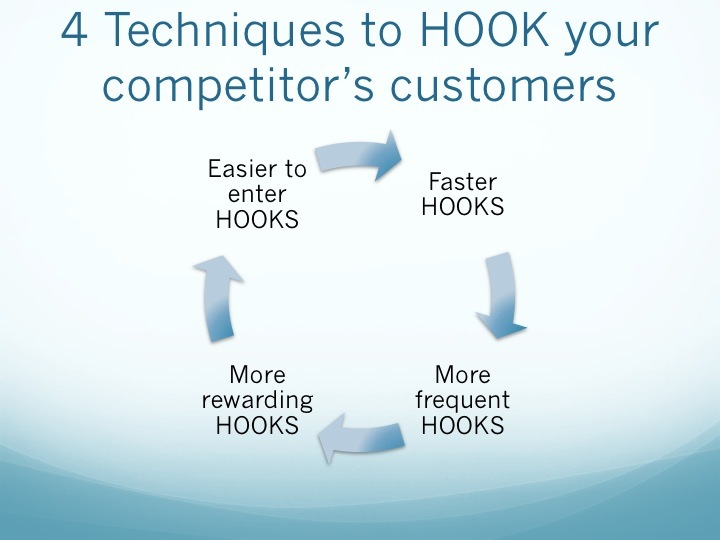 Nir’s presentation, “4 Ways to Win Your Competitor’s Customer Habits” (presentation below), shows the four ways companies build better hooks than their competitors. As a quick recap, the Hook Model describes an experience designed to connect the user’s problem to a solution frequently enough to form a habit. Eyal defines habits as behaviors done with little or no conscious thought. The convergence of access, data, and speed is making the world a more habit-forming place.Businesses that create customer habits gain a significant competitive advantage. It has four phases: trigger, action, variable reward, and investment. Eyal identified four ways to win customer habits. If your product becomes the one the customer is hooked on, then you will enjoy their continued business. The first technique is faster hooks. The faster the user passes through the model, the greater the product’s or game’s habit forming potential. Nir Eyal uses the example of Netflix, which won over people’s viewing habits from Blockbuster by delivering movies what were waiting for users rather than forcing them to get in a car, pick the movie, pay and drive home. In most businesses, the need to know what your competitors are doing is a given. In the social gaming space, however, competitive intelligence (CI) is either an afterthought or not even considered critical. That thinking at best leads to a sub-optimal product and at worst facilitates losing your market to another product. Good competitive intelligence is invaluable to all companies, including those in the mobile and casino gaming spaces. CI shows you the minimum quality level acceptable for your game. In the mobile space, most users will try multiple applications and then settle on one, a winner take all environment, though in casino they may play two or three. Thus, your potential customers are also playing your competitors’ products and deciding which one to invest their time in the future. If your game is clearly inferior, weaker graphics, slower tech, etc., you have lost. Your competitors are not stupid and you should learn from them. Internally, they are looking at the same opportunities and problems you are trying to tackle. By understanding features and initiatives they are taking to improve, they can inspire you on ways to manage the situation. Not that you want to copy everything they are doing, but understand how they are approach problems and if you have a different approach make sure your solution is better before deploying it. You can learn from their mistakes. It is great to make mistakes because it means you are trying unique initiatives; it is not great to repeat mistakes as that has no value. What is even better is if somebody else makes the mistake to learn from them without having the cost. You ensure you are value competitive. A car company would not never release a new model without understanding how its price and features compare with other cars. It would base the price on the competitive feature set, including branding, and then price their car so it is a reasonable option for consumers. Very few people will purchase an auto when they can get a comparable one for half the price.In the game space, companies mistakenly believe users are price inelastic. Many players, particularly those likely to monetize, understand what they are spending money for and how much they will get for it. The value is often in play time (e.g., I will spend $20 in a bingo app to play an extra hour). If the player feels your game is much more expensive than comparable games, they are less likely to spend in your app and will shift their spending to competitors (and you will see lower revenue from higher prices). 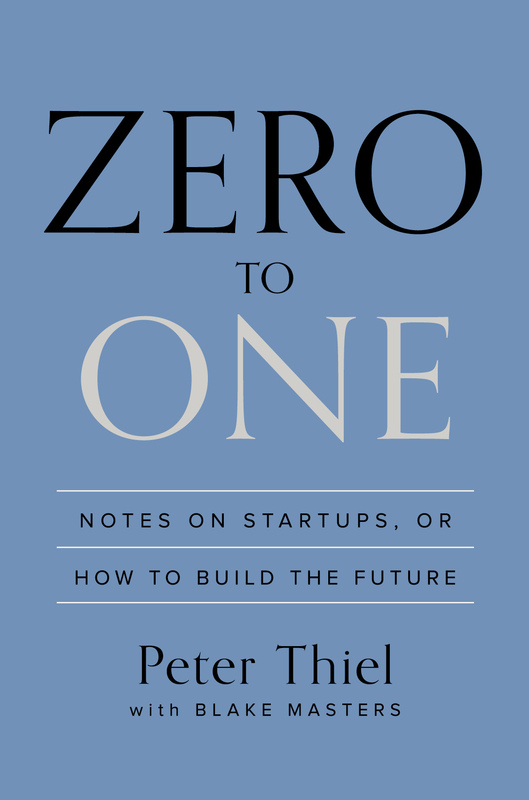 In Peter Thiel’s hot book, Zero to One: Notes on Startups, or How to Build the Future , he makes many interesting observations (some I agree with, some I do not) but one in particular is particularly valuable. Thiel asserts that great companies are not great because they beat their competition, they are great because they do not have competition. Although he does not quote Blue Ocean Strategy, it is very consistent with their thesis and data that shows that companies that create new markets have much higher economic returns than those who come up with new strategies to defeat their competition. Thiel’s point about the benefits of creating what he refers to as a monopoly, what I call a blue ocean opportunity, resonated with me as he use basic economics to prove the point. At its core, classical economics shows competition will drive out excess profits. That is why although Exxon makes a lot of money, they do not make a higher return on investment than another oil company. Whatever you are doing, somebody else will copy. One mistake I frequently see is when tech or game companies underestimate the competition, particularly when responding to a competitor’s product or game. Coupled with the need to be 9X better to get someone to switch to your product, this failure leads to many businesses nose-diving. When I recently updated my OpenTable app, I noticed they incorporated a partnership with Uber in which you can request a car when looking at an upcoming reservation and the car would already know your destination. This partnership between Uber and OpenTable is a great example of strategic thinking by both companies. I wanted to comment on it as I think all companies can learn some key lessons from the initiative. I’ve been talking a lot lately about mistakes made in the game industry, but one that constantly amazes me is the failure to understand the competitive landscape. This issue is not new to the social gaming space; I have lamented this problem for nearly 20 years. I am always amazed at how many products come to market with no awareness of the competition. Developers and publishers end up losing millions of dollars that could have been mitigated—or even avoided—by basic competitive intelligence.